Awesome Friday! » Blog Archive Review: Annihilation - Awesome Friday! There’s a moment in Annihilation, Alex Garland’s crazily ambitious directorial follow-up to Ex Machina, that signals the world has changed in dangerous, unimaginable ways. Fresh from an attack from a swamp alligator that’s at least two sizes too big, we see the exploration team prise its monstrous mouth open to reveal rows upon rows of teeth that shouldn’t be there. It’s a trick long used in horror stories, one of mine included – the signal of incoming biting, slicing, digestion, excretion, destruction of flesh and even bone – and, here too, it’s a sign for the audience. Annihilation may have been sold as a surreal sci-fi – and it certainly is that – but it also has serious teeth, ready to crush you into submission with some truly disturbing moments and images of pure horror. The story plays out slowly, often giving vital information in the latter half that completely recontextualises each character’s motivations. The trigger for all this is a meteor/comet/celestial object that crashes neatly into the lighthouse on the coastal edge of a national park, creating a “shimmer” that slowly grows outwards. Over the course of the next few years, army teams are sent through the shimmer walls; each goes silent, never to return, save for Oscar Isaac’s soldier who somehow finds his way back to a bewildered, grieving Nathalie Portman. It’s worth getting this out of the way early, then often repeating: Natalie Portman is one of the greatest actors currently working, and her portrayal of Issac’s broken wife is raw and real in ways that are difficult to describe. Soon, due to motivations that we only learn much later, she is part of the next expedition team ready to enter the shimmer, this time consisting of female scientists instead of male soldiers. Their objective is to collect data and, hopefully, find a trace of those that went before them. Their theories of what the shimmer could contain is grounded in human reality; what they find inside is not. How they grow to understand the truth of the shimmer reveals each of them utterly; every reaction to the horror unfolding around them is subtle and authentic. Outside of Portman, the rest of the cast is similarly stellar, each using understated performances that slowly unhinge as the pressure builds. Tessa Thompson, in particular, is a revelation; to go from her cocksure Valkyrie in Thor: Ragnarok to her insular young scientist in Annihilation reveals her incredible range, and I’m sure that when I finally watch Creed this will be even more apparent. And what truth it is. Never mind the performances and growing, gruesome horror; in Annihilation, Alex Garland has made a filmic spectacle that would make Kubrick jealous. If you’ve seen Ex Machina – and, if you haven’t, that’s your first stop tonight – then the beautiful framing and cinematography will be of no surprise. However, Garland here shows a richness and maturity that tops even his previous work; the thick, voluptuous vegetation is bursting with colour, all backed by the streaming nature of the shimmer, itself a constant rainbow of upward movement. This style continues to the end, as common becomes alien, and the way Portman sells the fear really makes it all the more terrifying. The action, too, has a heft that shows the director in full control of his narrative pacing. In particular, to say that Garland doesn’t shy away from the horror is putting it mildly; there will be multiple points – and one unforgettable sequence – where you’ll find it hard to even look at the screen. Matt put it perfectly when he said that he hadn’t felt that level of discomfort in a movie since Under The Skin, and there are definite parallels, least of all being the incredible, threatening soundtrack. It’s just one film that you can trace in Annihilation‘s twisted DNA, along with elements of The Thing, Alien, and 2001: A Space Odyssey. However, it’s not just outright stealing. Annihilation creates a unique atmosphere, one made so much more intense from seeing it on the big screen. It breaks my heart that it had such a limited international release and is even being farmed out to Netflix soon. Apparently a Paramount producer was worried it would be too complicated, leading him to cover his bases with a Netflix deal. And you could look on the plus side, that it’s more likely to reach a wider audience on that platform. But it’s the implication that complicated, female-led stories don’t sell that is the most worrying. 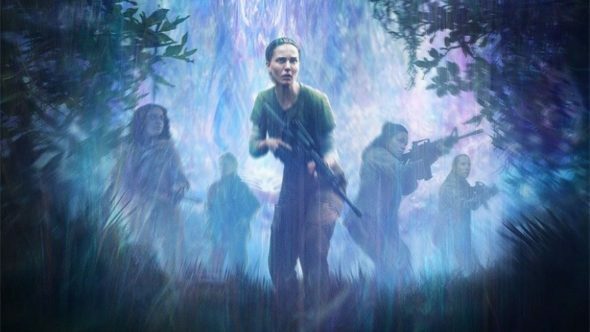 Annihilation is exactly the kind of original film that we should be getting in our cinemas, instead of the constant stream of safer blockbusters. It is made for a wide screen in a dark room, for a willing bunch of strangers to experience the horrors together. It is the kind of movie whose reputation will only grow as the years pass, and there’s going to be a fair amount of people that are going to wish they’d seen it on the big screen. So, if you get the chance, do yourself a favour and buy yourself a ticket. Not only will you be supporting fresh, original sci-fi, you’ll be immersing yourself into an incredible, horrific cinematic experience that has become my favourite film of the last five years.